All transactions are safe and secure with a reliable history in online purchasing behind each of our associates. Buy the Quinn of Hearts t-shirt to own Batman clothing and merchandise. 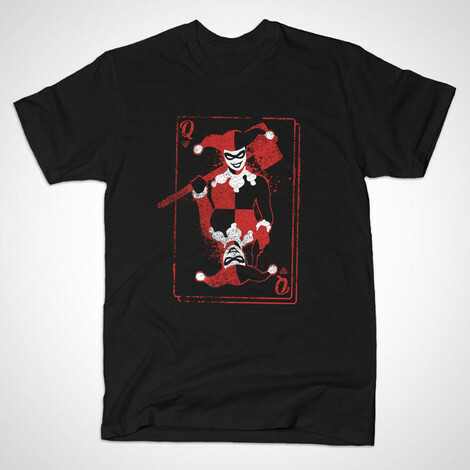 This Batman tee shirt features Harley Quinn on a playing card. After all, she is the Joker's sidekick. Dr. Harleen Frances Quinzel, M.D. was interning at Arkham Asylum when she met the Joker. She fell in love with him and eventually helped him to escape. Wear this Harley Quinn shirt under a Batman hoodie, so that you can stay warm while you're tuning up the Batmobile in the Bat Cave. In addition to the Quinn of Hearts tee above, browse the Batman Clothing Gallery for more apparel like men's and women's clothes, kids shirts or hoodies.